Tnx for letting me take part! Brief Synopsis – While on a camping trip, a suburban family accidentally injure a Sasquatch and bring him home where he causes much problems when they try to keep it a secret. My Take on it – This is a film that I recall seeing when it originally came out in the theater and it unfortunately hasn’t aged very well. It was much more entertaining back then that it is now and that has to probably do with the fact that the jokes are all quite mediocre in an 80’s sort of way. The cast has some great actors involved with this story, but even with the likes of John Lithgow, Melinda Dillon, Don Ameche and M. Emmet Walsh, it isn’t able to raise above the level of feeling very average because something constantly feels as if it is missing from the story that would make it more enjoyable. The plot constantly parodies itself and most of the comic moments miss the target except for a few bouts of physical comedy that are extreme yet still humorous dealing with the mas of “harry” and how that would affect a normal household. Unfortunately, they also understood that those few moments would get the most laughs, so they have similar scenarios constantly replaying which gets a bit tedious. The standout among the cast is Walsh as Lithgow’s father and despite the fact that there is really only a ten year gap between the ages of these men, we still get a clear idea of the father-son relationship between the two of them and how that in turn affects the kind of relationship Lithgow wants to create with his own son. Bottom Line – Mediocre comedy that doesn’t work as well as it probably did when it came out over 30 years ago. The cast is good here, but even with the likes of Lithgow, Dillon, Ameche and Walsh something constantly feels missing. 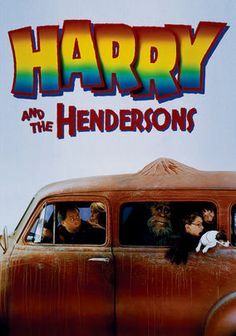 The plot itself parodies itself and they don’t manage to get the comedy right except for a few instances where the physical mass of “Harry” is used for a laugh. Unfortunately, they overdue things a bit and some of the jokes are repeated too much which takes away from the humor of those elements. Walsh is great as Lithgow’s father (despite only a ten year age gap between the actors) and it’s quite easy to see what kind of father-son relationship they have that Lithgow wants to change with his own son. that’s what I’m here for :). Unfortunately, there are terrible and mediocre movies out there, but someone needs to see them and point them out to all u great folks. I saved it for last since I also didn’t have high expectations at all. Thanks for “taking one for the team” for all of us!